Cascadia is the land and bioregion that defines the Pacific Northwest of North America through the watersheds of the Columbia, Fraser and Snake rivers. This powerful idea and movement began at the first Cascadian Bioregional Congress on July 25, 1986 held at Evergreen State College in Olympia and celebrated it’s 30th anniversary in 2016. Cascadia and its underlying philosophy of bioregionalism continue to inspire future generations to challenge the status quo and what is possible, envision something different and act on what could be. Today, tens of thousands of individuals, hundreds of businesses and organizations, movements and causes have adopted and promote this positive regional identity and movement. What is the world that you would want to live in if all reality were stripped away? What does a world look like where people live happily, their needs met and in balance with their environments? What would this society look like? What steps can we take to get us there? With this passport, we invite you to join us as a citizen and inhabitant of our bioregion that spreads these principles and makes this vision a reality. bioregion defined by the watersheds of the Columbia and Fraser river valleys that stretches from Northern California to south east Alaska and as far east as the Yellowstone Caldera and continental divide. It encompasses most of the states and province of British Columbia, Washington, Oregon and Idaho, and parts of southeast Alaska, Northern California and Western Montana. inclusive social, economic, cultural and political movement to empower every individual and community to be active around issues they care, and find solidarity and support. regional identity rooted in a love of place and stemming from shared experiences, environment, and need, as well as principles and values. As a bioregional movement - a much more common definition is simply to further local autonomy, empower individuals and communities to better represent their own needs, push for environmental and economic responsibility, and increase dynamic, transparent and open governance. The Cascadia movement encourages people to re-engage with their local communities, develop local and personal resilience (community gardens, disaster preparedness, etc. ), and create alternate lines of regional communication, politics, and interdependence that better represent the social, cultural and political boundaries that define our region. The term Cascadia was adopted in 1981 by Seattle University professor David McCloskey, as a way to better describe our growing regional identity. McCloskey describes Cascadia as "a land of falling waters." He notes the blending of the natural integrity and the sociocultural unity that gives Cascadia its character. Definitions of the region's boundaries vary, but usually include the area between the Cascade Range and the Pacific Ocean, and some part of the Coast Mountains. Other definitions follow the boundaries of existing subnational entities, and usually include the territory of British Columbia, Washington, and Oregon, while others also include parts of California, Idaho, Alaska and Yukon. 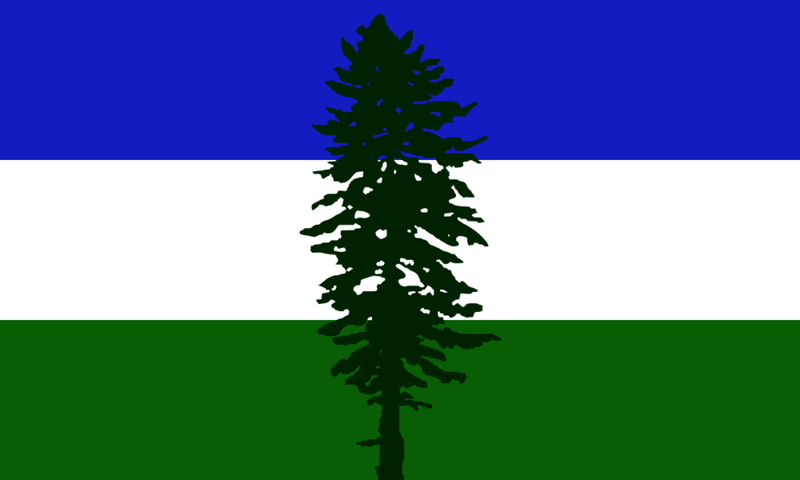 The Cascadia Doug Flag is held in a Creative Commons License CC BY-SA 2.5-2.0-1.0 and is available for re-use and designs. Please make sure to attribute the flag creator Alexander Baretich, and read his statement against use for any type of perceived hate speech. Please use, re-use, create and share!